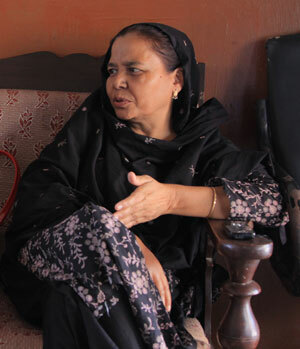 Parveen Saeed is the founder of Khana Ghar, an outfit that provides heavily subsidised meals to the city’s poor. The three-rupee meal served at Khana Ghar includes one roti and a plate of curry. Essentially a housewife, Saeed was drawn to feeding the poor when she read the story of a local woman who killed her two children because she could not afford to feed them. She set up Khana Ghar in January 2002 and gradually drew in family, friends and others to help set up food houses and distribution points. Saeed plans to continue devoting her life to this initiative and dreams of being able to feed everyone everywhere. A soft-spoken, humble woman, who is usually seen wearing old, faded clothes, 52-year-old Saeed rarely ventures out without covering her head. She speaks in Urdu, and strains hard to understand English, answering the most difficult queries with a smile and a nod. Saeed is reluctant to admit that she has done anything worthy of praise and recognition but, only recently, she was honoured by Timberland Pakistan’s Green Awards for her meritorious service. What inspired you to start Khana Ghar? I started this work 11 years ago when I learnt that a mother had killed her children herself due to extreme poverty. Her children had gone hungry for a few days because she did not have enough money to feed them. Where is Khana Ghar located? It is located in Khuda ki Basti, Taiser Town. I found this to be an ideal place because it is specially developed for daily wage labourers. When I started, the town was quite deserted, but gradually it was occupied by poor people, mostly daily wage earners. Who serves at Khana Ghar? 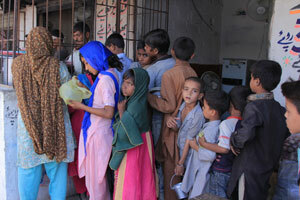 The food at Khana Ghar is served by two children. What does a meal consist of? We serve daal, vegetable curry, Kabuli chanay, karhi on weekdays and meat curry on ­­Sundays. The helpings constitute a plate of curry and a roti for each person. Who are the people who come to Khana Ghar? They are mainly daily-wage workers such as factory labourers and widows, orphans and old people whose children have abandoned them. We also serve women who work as domestics in homes, as well as their children. I began this work from my own house and at that time I had no idea that it would grow so much. As time passed, I realised I needed a larger work force and additional support. My relatives and friends had already helped me immensely from the inception. Now, many more people voluntarily contact me to offer their support. Who cooks for the people? Do you cook yourself? 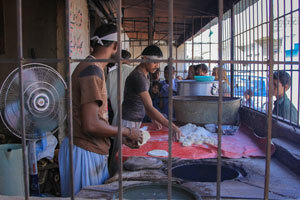 I have one female worker who cooks curry and for the tandoor we have three male workers. Initially, I would cook but as the workload increased, I appointed a female worker to help me out. Actually, the basic purpose was to generate employment. Do you serve breakfast as well? Due to a shortage of funds, we are only able to serve lunch and dinner. Do you have a separate kitchen for your family? Yes, I have my own home and kitchen. How do you take care of your family? When the head of the family supports you, your work will find its way, and it becomes very easy to focus on what you want to do. I have two daughters, one is married and the other one is about to graduate. Tell us something about your background and your education. My father worked in T&T and I spent my childhood in the PECHS. I have four brothers and two sisters. I did my matric from the PECHS Model School, and my intermediate and Bachelors from PECHS Government College. Later, I did my masters in journalism from Karachi University. I was interested in writing and dreamt of becoming a great writer one day. How many people do you feed in one day? We serve almost 2000 people each day, mashallah. How many hours a day do you devote to Khana Ghar? I have to devote at least two to three hours a day. I usually come to the site in the afternoon or in the evening. What inspires you to do this work? The fact that the people we are feeding cannot afford to arrange even one square meal a day for themselves and their families. That is my motivation. Do you feel it’s possible to defeat hunger? Hunger can never be eliminated until and unless the government plays the role it should be playing. As for us, neither do we have any sponsors nor do we claim anything [from any agency]. If anyone wants to help, they come to us voluntarily. khana ghar parveen saeed. please let me know your latest phone number. we have to help people of khuda ki basti. (Alms are) for the poor who are confined in the way of Allah– they cannot go about in the land; the ignorant man thinks them to be rich on account of (their) abstaining (from begging); you can recognise them by their mark; they do not beg from men importunately; and whatever good thing you spend, surely Allah knows it.